Hey folks, Jack here. I wanted to take a bit of time and talk about a series of upcoming PDFs for Fantasy AGE that be coming in the next few months. These are a series of short encounter-based scenarios that GMs can use to jumpstart a session or use to fill in between major adventures. They aren’t full adventures, but most can easily lead to them. Originally this product was envisioned for Dragon Age. However, the realities of needing to send Dragon Age content to approvals with Bioware makes an even semi­regular PDF series very difficult. So instead, we’re taking the basic idea and doing it in Fantasy AGE, where the approvals step is absent from design and production. Each encounter is designed to give GMs a set­up section to get the PCs involved, some optional or random occurrences that can make each longer, shorter, more dangerous, and so forth. Also included are suggestions of how this single encounter can spin off into a large part of a campaign. Each PDF usually details an initial encounter and then one or two logical follow up encounters that will resolve the problems or challenge presented. So maybe while traveling through a war­-torn region, the PCs come across a band of refugee children pursued by a cult of religious extremists. The cult wants the refugees, believing them dangerous heretics possessed by dark powers. The children were being smuggled out of the war zone, but their protectors have been slain. What do the PCs do? Do they transport the children to safety? Find a place that will take them in? Turn them in for a reward? What random occurrences may happen while the kids are in their charge? These are the sorts of scenarios this series covers. When possible, monsters and other items from Fantasy AGE are used, keeping these products concise and inexpensive. They’re meant to be affordable supplementary material for GMs to use as needed and we wanted to keep to that idea as much as possible. However, all of them have one or two “new cool things” that the encounter required. This might be a statblock for an enemy or monster, a magic item, or possibly even a new spell or ability. The first three Encounters are currently in production (two edited and with layout, one in editing). I have two or three more already written which just need some small changes before they move down the line. So while we’re not ready to announce the exact release date for this series yet (or even commit to its exact title), they are pretty far along and the first will be arriving shortly. Also, we aren’t committing to a particular number of encounters—we’d like to see how it does and make adjustments as necessary. We’d like it to be a popular series that grows into a sizable library of releases. 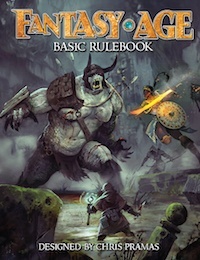 However, first we just want to get some new content out to all the fine folks who have already picked up and are enjoying Fantasy AGE.